Provide comfort for the family of Ronald Perras with a meaningful gesture of sympathy. 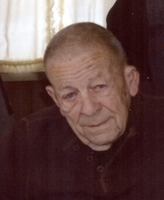 RONALD ERNEST PERRAS SR, 88 OF North Adams, MA died on April 10, 2019 at the Berkshire Medical Center in Pittsfield, MA. He was born in North Adams, MA on June 6, 1930 a son to the late William and Elizabeth (Dumoulin) Perras-Franchomme. He attended schools in North Adams. He was a decorated veteran of the US Army as a Private with the Tank Company 3rd Battalion. Mr. Perras’ employment history included working at the Greylock Mills in North Adams. He then worked at Mt. Snow Ski Resort, Maxymillian and Arnold Print Works. He was last employed for many years as the caretaker of the family estate of RC Sprague. Mr. Perras married the love of his life, Bertha Arlene Godfrey on October 28, 1950. She died on June 3, 2017. Survivors include his daughter, Susan (Mark) Coviello of Adams; and sons, Timothy Perras of North Adams and Bruce (Eva) Perras of Las Vegas, NV. He also leaves his grandchildren Joe T. Perras, Jeremy Perras, Timmy Perras, Jason Lescarbeau, Tasha Perras, Jennifer Perras, Joshua Perras, Neisa Lescarbeau, Travis Perras and Ronald Perras III. He was predeceased by two sons, Ronald Perras Jr. who died in 2003 and Robert Perras who died in 1964; as well as two sisters, Gladys Siciliano who died in 2000, and Frances Gigliotti who died in 1998; and a brother Bernard Perras who died in 1987. To send flowers in memory of Ronald Ernest Perras Sr., please visit our Heartfelt Sympathies Store. Provide comfort for the family of Ronald Ernest Perras Sr. by sending flowers.